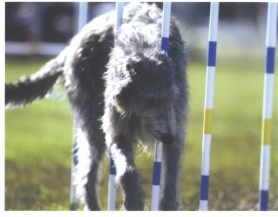 Although there are Deerhounders who compete at the very highest level of agility, I am not one of them. 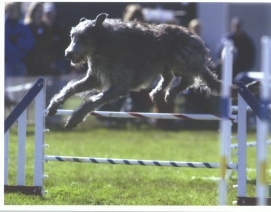 Since I discovered agility, I have made it a point to introduce all our dogs to the sport, and those who enjoy it and show aptitude continue to a point at which they may, if the stars are aligned right, actually compete. Currently, Beau, Rain and Memsie are playing somewhat seriously at agility. Fillan is pictured below. He is the first (and so far the only) of our dogs to actually earn an agility title, competing his Novice Jumpers title at the advanced age of 8!